Isolated unilateral hypoglossal nerve palsy (HNP) is uncommon with only a few casereports and two case series in literature. Our study is the largest case series including12 patients. Till date isolated HNP was considered an ominous clinical sign indicatingan underlying malignancy, however ,in the present case series treatable causessuch as tubercular central nervous system infection(33%)and idiopathic (25%) casesoverweighed the neoplastic (16%) etiology. Sarcoidosis (8%), atlanto occipital dislocation(8%) and aberrant ectatic vessel in the hypoglossal canal (8%) were contributoryin the remaining cases.60% of the patients had a significant clinical recovery duringfollow up. The present study emphasizes that isolated HNP does not always herald agrave prognosis and an extensive diagnostic workup in these cases may yield commonand potentially treatable etiologies. Isolated; Unilateral; Hypoglossal Nerve; Tubercular Meningitis; Idiopathic. Isolated hypoglossal nerve palsy is rare due to its complex course and close proximity to other cranial nerves and vessels. It also represents a diagnostic challenge in every day clinical practice due to its diverse etiologies. There have been many published single case reports on isolated unilateral hypoglossal nerve involvement but case series are sparse in neurological literature. Till date there have been only two published case series on this subject ,one including four patients  and another nine patients . Keane et al. 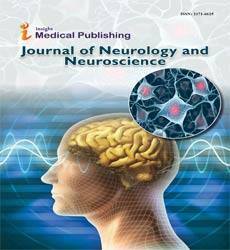 published his personal experience of 26 years on hypoglossal nerve palsy in 100 patients with or without the involvement of other brain stem structures. Thus, it would be worthwhile to state that isolated and unilateral hypoglossal nerve palsy seems either extremely rare or under-reported.Present case series includes 12 patients of isolated unilateral hypoglossal nerve palsy due to different etiologies, making it the largest case series till date, to the best of our knowledge. All the cases of mono-symptomatic tongue weakness admitted in the wards or attending the outpatient department in a tertiary care centre of north-west India(SMS Medical College,Jaipur,Rajasthan), over a 7 year period (2003-2009) were included in the study. 12 cases fulfilled the inclusion criteria of unilateral, monosymptomatic hypoglossal nerve palsy in the absence of any other neurological deficits. Those cases with bilateral hypoglossal nerve palsies, involvement of contiguous cranial nerves, hemiparesis or any other focal deficits were excluded from the study. All these patients were subjected to a detailed evaluation including clinical history, physical and neurological examination as per the standard protocol in our hospital. All the cases underwent detailed investigations comprising of routine blood chemistry including ESR,serum calcium, syphilis serology(VDRL), HIV serology, serum protein electrophoresis, vasculitic profile (rheumatoid factor, ANA,anti ds DNA),serum angiotensin converting enzyme(ACE)levels and serum Brucella/Epstein bar virus(EBV) antibodies. Other investigations included cerebrospinal fluid(CSF) biochemistry,CSF Polymerase chain reaction for tuberculosis,CSF VDRL, staining for fungus/ Acid fast bacillus(AFB) and bacterial culture. All these patients essentially underwent neuroimaging including contrast Magnetic resonance imaging (MRI) of the brain with the base of skull tracing the hypoglossal canal and the hypoglossal nerve throughout its course. All the patients were followed up in the outpatient department (at 1 month,2 months,3 months and 6 months after the first evaluation) by the neurologist and clinical status was recorded as no improvement, partial resolution or complete resolution of signs and symptoms. Only four of these cases recalled history of intermittent low grade fever and dull headache 20 to 45 days prior to presentation. They denied any symptoms of cough, decreased appetite, weight loss or past history of tuberculosis or antitubercular treatment. Neurological examination revealed presence of unilateral, isolated hypoglossal nerve palsy. Three patients had affection of the left hypoglossal nerve and one had right hypoglossal nerve palsy. In addition, in these cases neck stiffness and kerning’s sign were elicitable. Cerebrospinal fluid examination showed pleocytosis ( white blood cells 50-500/mm3 ,mostly lymphocytes), high proteins (100-300 mg %) and low sugar (30-55 mg%) in all the cases and a positive PCR for tuberculosis in 3 cases.CSF VDRL,serum ACE levels, and HIV serology were negative in these cases. Serum calcium was normal and CT chest did not show any hilar lymphadenopathy. Magnetic resonance imaging of the brain revealed leptomenigeal enhancement and exudates. On the basis of CSF findings and neuroimaging these patients were put on anti tubercular treatment. At 6 months follow up there was a complete resolution of tongue deviation and meningeal signs and all the patients had gained weight and had a generally improved physical status. A specific etiology could not be established in 3 cases despite extensive and meticulous investigations. These patients had acute onset hypoglossal nerve palsy of 16-21 days duration. One case had left sided palsy and the other two had right sided palsy. They presented with acute onset tongue deviation without any preceding history of fever, upper respiratory tract infection or gastrointestinal infection. As no specific etiology could be identified in these cases, these were labeled as idiopathic isolated unilateral hypoglossal nerve palsy (akin to Bell’s palsy) and complete resolution of tongue deviation occurred after a short course(10 days) of oral steroids in 2-3 months. In rest of the 5 cases different etiologies were identified as follows:- One of the cases presented with moderate to severe pain and heaviness of the tongue and right sided deviation on tongue protrusion.MRI of the base of brain revealed right sided carcinomatous infiltration of tongue with hypoglossal nerve entrapment. Despite best efforts by oncologists and ENT surgeons, this patient died in 6 months. Another patient had history of occasional epistaxis prior to presentation and imaging revealed infiltrative lesions of clivus with extensive destruction of the left hypoglossal canal, left occipital condyle and margins of foramen magnum which was diagnosed as chordoma. This patient died within 2 months of onset of illness. One case had a 3 months history of intermittent headache and difficulty in moving the food bolus inside the mouth. Neurological examination showed atrophy of the right side of tongue. Curiously his chest X-ray and contrast enhanced CT chest showed bilateral hilar lymphadenopathy. Blood investigations revealed a high ESR (80mm FHR) and raised serum ACE level (120 IU/L). Contrast MRI of the brain in this patient revealed basal pachymeningitis.CSF examination including PCR for Mycobacterium tuberculosis and VDRL were negative.HIV serology was also negative. Patient denied any further work up so a lymph node biopsy could not be obtained. Considering the possibility of neurosarcoidosis, this patient was put on oral steroids (methylprednisolone 1 mg/kg/day gradually tapered and maintained on 8 mg/day). On subsequent follow up at 2 months, there was recovery in the tongue weakness. Another case had a non progressive unilateral, hypoglossal nerve palsy for past 10 years. MRI of the brain with base of skull showed an aberrant ectatic vessel compressing the twelfth nerve in the hypoglossal canal probably arising from internal jugular vein (emissary vein). Rest of the diagnostic work up was negative. And the last case was an elderly female, a known case of rheumatoid arthritis, who presented with neck pain and progressive dysarthria and difficulty in moving the food bolus while swallowing. There was no suggestion of a myelopathy in the form of limb weakness or bladder bowel involvement. Clinical examination surprisingly did not reveal any other cranial nerve involvement apart from the hypoglossal nerve.MRI of the craniovertebral junction revealed pannus formation and destruction of dens with horizontal subluxation of atlanto occipital joint causing compression of the right hypoglossal nerve. This patient was referred to neurosurgery, postoperatively neck pain improved but the tongue weakness persisted. Hypoglossal nerve involvement in association with other cranial nerves is common, however isolated unilateral hypoglossal nerve palsy is a rare finding. The common causes[1,4-17] of unilateral hypoglossal nerve palsy are nasopharyngeal carcinomas, metastasis to the base of skull ,carcinomatous meningitis , trauma[1,13], dolichoectasia of the vertebral artery,dissection of extracranial internal carotid artery [9,10],hypoglossal schwannoma, Epstein Barr virus infection, post vaccination cranial neuritis etc. There have also been case reports of isolated HNP due to multiple myeloma, dural A V fistula, internal carotid artery aneurysm, rheumatoid arthritis,clival tumor, as a complication of radiotherapy, posterior fossa arachnoid cyst, acute inflammatory demyelinating polyneuropathy (AIDP) , acute disseminated encephalomyelitis(ADEM) etc. Keane et al  in his study, the largest case series of hypoglossal nerve palsy, found neoplastic etiology in 85% of his cases, thus emphasizing that isolated hypoglossal nerve palsy often heralds an ominous prognostic sign. However, case series of isolated HNP by O. Combarros et al reported idiopathic hypoglossal nerve palsy in 4 out of his 9 cases and metastasis ( 3 cases), Arnold Chiari malformation ( 1 case) and dural AV fistula in (1 case) in the remaining patients .Another case series of 4 patients with isolated HNP by Marina Boban et al  included pseudo aneurysm of internal carotid artery, metastasis, ADEM and clival tumor as etiologies. Our case series of isolated HNP is the largest (including 12 patients) reported till date to the best of our knowledge. Tubercular meningitis has not yet been mentioned as a cause of isolated unilateral twelfth nerve palsy in the available literature. 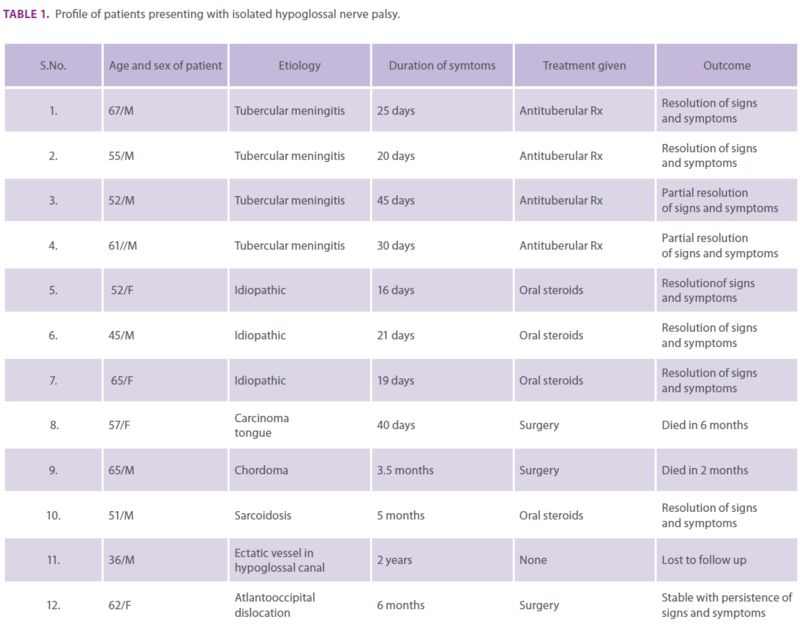 Out of the 12 cases in the present series, four had isolated HNP due to tubercular meningitis. Involvement of the hypoglossal nerve in the setting of tubercular meningitis could be attributed to granulomatous basal meningitis, nerve granulomas, or vasculitic infarction. Same pathology may be proposed in the case with neurosarcoidosis. In three cases, no cause was identifiable despite thorough investigations and they were treated as idiopathic, monosymptomatic reversible isolated unilateral hypoglossal nerve palsy, an entity similar to Bell’s palsy, which has not yet attracted the attention of clinicians.These patients responded very well to a 10 day course of oral steroids. Whether the pathogenesis of this condition also bears similarity to Bell’s palsy or is it a very restricted form of demyelination as in polyneuritis cranialis, a variant of Guillain Barre syndrome , may be an interesting arena to explore. The significance of obtaining a good MRI brain scan dissecting the base of skull and tracing the complete course of the hypoglossal nerve cannot be overemphasized when evaluating a case of hypoglossal nerve palsy. Outcome necessarily depends on the etiology.Since previous studies have emphasized neoplastic pathology as the most common cause of hypoglossal nerve palsy; it is considered a grave sign . However in our case series most of the cases had a good outcome because the commoner etiologies included potentially treatable conditions like tubercular meningitis, sarcoidosis, reversible idiopathic hypoglossal nerve palsy etc. This fact highlights the need for an extensive evaluation by clinicians in cases of hypoglossal nerve palsy lest they miss treatable and reversible conditions. Table 1. Profile of patients presenting with isolated hypoglossal nerve palsy. Our case series is the largest case series of isolated unilateral HNP to the best of our knowledge. This study also challenges the long held belief that isolated unilateral hypoglossal nerve palsy almost always heralds a malignancy. We emphasize the need of an extensive diagnostic workup and correct and timely diagnosis of potentially treatable etiologies in cases of isolated HNP. Keane JR. Twelfth nerve palsy. Analysis of 100 cases. Arch neurol1996; 53:561-566. Marina Boban, Vesna V.Brinar, Mario Habek. Isolated hypoglossal nerve palsy: A diagnostic challenge. Eur Neuro2007; 58:177 -181. O.Combaross ,Alvarez deArcayaA Bercino J. Isolated unilateral hypogossal nerve palsy: nine cases. J Neurol1998; 245:98-100. Tommasi-Devenas C, Vighetto A, Confobreux C et al. Causes of paralysis of hypoglossal nerve; a propos of 32 cases. Press med 1990;19:864-868. Chong VF,Fan YF. Hypoglossal nerve palsy in nasopharyngeal carcinoma. Eur Radiol 1998;8 (6):939-45. Greenberg HS ,Deck MDF, Vikram B, Chu FCH, Posner JB. Metastasis to base of skull: Clinical finding in 43 patients. Neurology 1981;31:530-537. Graham RM, Thomson EF, Baldwin AG. Isolated hypoglossal nerve palsy due to vascular anomaly. 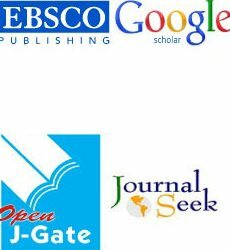 Int j oral maxillofac surg 2007;36(8):759-61. Rubinsteine MK (1969).cranial mononeuropathy as the first sign of intracranial metastasis. Ann intern 76 med70:49-50. Christopher Spitzer, Michael Mull, Rudolf Topper. Isolated hypoglossal nerve palsy caused by carotid artery dissection. J Neurol 2001;248:909-910. Morelli RJ. Intracranial neurilemomma of hypoglossal nerve: review and case report. Neurology(1966);16:709-713. Felix JK, Schwarz RH, Myers GJ Twelfth nerve palsy following influenza vaccination Am j Dis child(1976);130:82-83. Afifi AK, Rifai ZH, Faris K. Bisolated reversible hypogossal nerve palsy. arch neuro 1984; 41:1218. Giuffrid S, Lo Bartolo ML,Nicoletti A etal: Isolated ,unilateral, reversible palsy of the hypoglossal nerve. Arch otolaryngo H,Eur j Neurol. 2000 7(3):347-9. Nikhil Marwah, Archana Agnihotri, Mahesh Goyal. Idiopathic unilateral isolated hypoglossal nerve palsy: A case report. J Oral Health Dent 2008;2(3) 62-64. Ahmet Colak, Selcuk Peker, Ozdermir Gurcay. Behsan Onol. isolated hypoglossal nerve palsy due to chordoma Turkish Neurosurgery 1993;4:164-165. Aki Konishi, Ryzuburo Higo, Takaharu Nito, Tomohiko Masumoto. A case report of unilateral hypoglossal neuroparalysis from horizontal subluxation in the Atlanto -occpital Joint due to Rheumatoid arthritis. Journ ORL 2003;65:306-309. M.H.Blomquist, J. D. Barr, R.W.Hurst. Isolated unilateral hypogossal neuropathy caused by Dural Arterio venous Fistula. AJNR1998;19:951-953.